We all face various kinds of challenging situations in our lives during our life journey to the world of success. Many of us fall by the way and we cannot stand and move forward because we are armed with the problem solving formula. Einstein, when asked how he would spend his time if he was given an hour to solve a thorny problem, said he’d spend 55 minutes defining the problem and alternatives and 5 minutes solving it. The above is exactly opposite of what the vast majority of executives today would do when faced with a challenge. In order to solve any problem you must have a positive approach to the problem. The problem will be easy to solve if your mind is set to solve the problem. 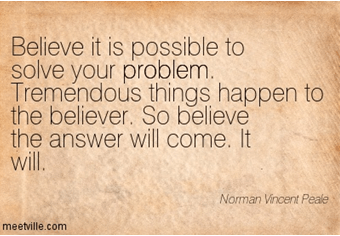 The problem will be impossible if you make the problem impossible in your mind. You have to identify or recognize the problem and not the symptoms of the problem. The identified problem must be properly and objectively described. There is a need to find what caused the problem and getting a feel of how the problem looks like. You have to research on the problem from different angles in order to understand it very clearly. Evaluate the different ways the problem could impact you. The extent of the impact of the problem will help you in risk ranking the problem. Develop a plan of how you are going to solve the problem. The plan will helps you to focus on critical areas of the problem. You have to come up with as many solutions as you possibly can for the problem through a brain storming exercise. You have to be creative enough in coming up with possible solutions. No solution should be discarded at the brain storming phase. The process of generating possible solutions will help you look at the problem from different angles. It is possible to break down the problem in order to generate possible solutions for components of the problem. Finally action must be taken to implement the identified effective solution to the problem. You should keep reviewing and monitoring the progress of the solution you have implemented. The solution may not work perfectly because of some issues you may have been overlooked. This requires you to make the necessary adjustments as you implement the solution. You should always look at a challenge or a problem as an opportunity to do better. 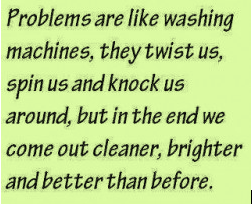 Every problem has a silver lining and you should focus your mind on the silver lining. Always remember there is nothing impossible in life and impossibility is self created.